This review is a long overdue I think but I didn’t want to write a review of the season until I had some time to sit down and analyse where it went wrong in my first year on BetAdvisor. As a quick recap for readers not familiar with The Football Analyst (TFA), last season was the first season I had a system on BetAdvisor but the subscription service I run is coming up for its 4th season now. The service continues to go from strength to strength and the service won a host of awards in the 2013 Secret Betting Club (SBC) tipster awards including 2nd place in the best overall tipster category and 2nd place in the best football tipster category. These awards are based on SBC member votes, so they are difficult to win against all the other tipsters in the market. I was approached by BetAdvisor in the Summer of 2012 about developing a unique UK football system that can be shared with BetAdvisor clients. I agreed to give it a go and a unique BetAdvisor TFA system was built late in Summer 2012 and backtested against previous seasons like my other systems. The profitability of all TFA systems is monitored to backing outright, AH0, AH0.25 and AH0.50 for all system bets. However, all systems are proofed to outright betting by the Secret Betting Club. The BetAdvisor system was a unique system where the AH line chosen for each selection was the line closest to odds of 2.00. The odds quoted for all TFA systems is done through a fair pricing policy looking at UK bookmakers and quoting a general price in the market. All BetAdvisor system bets odds were available with Pinnacle or SBO only. All TFA system bets were released to members on a Thursday/Monday evening. BetAdvisor system bets were generally released on a Saturday morning for weekend bets. Very few midweek bets were released for the BetAdvisor system as many of the bets had already been given out to TFA members and the odds movement thereafter ensured that little value was still available on these bets thereafter. Although these 3 differences were known at the outset, I don’t think I quite realised the impact that these things would have on the BetAdvisor system. Using an AH line closest to 2.00 may have provided a much smoother journey than following the bets outright but it also eroded the edge that the system had unfortunately. The odds available on a Saturday morning for the BetAdvisor were usually 10%-20% worse than the odds available on a Thursday evening. Midweek bets were a major issue as simply, the BetAdvisor system couldn’t give out any midweek bets the odds movement was substantial on some of the high value bets. Although it was a decision I made independently last season, only using Pinnacle/SBO to quote odds for the BetAdvisor system also had a major impact on the performance of the system as the returns could have been beaten easily by making the AH line by backing the win/draw in the outright market with UK bookmakers. The other main issue the BetAdvisor system had compared to the UK systems was the restrictions imposed by BetAdvisor in the first season. Obviously, considering the system was a new system and had no proofed results beforehand, it was perfectly reasonable to expect restrictions to be imposed to help protect BetAdvisor clients. However, given the BetAdvisor system was an automated system, it did impact the profitability of the system at times. If I was able to give out bets on a Tuesday evening at 6.30pm for 7.45pm kick-off games, I would have given out more midweek bets but all bets had to be given out at least 2 hours in advance of kick-off and personally, that made it very difficult for me. My maximum exposure was capped at 15% for any set of bets and after a poor weekend, this maximum exposure would reduce. The max number of bets at any time was 5. Some weekends, I was only able to give out bets to a maximum exposure of 8% of the bank. Clearly, for a fully automated system, this played havoc with the staking plan. Some weeks, I would be wanting to play 25% exposure on lots of strong bets and was only allowed to play 8% and therefore, the best bets would sometimes be heavily under staked. In other weeks, there would be a plethora of weaker bets thrown up and I was capped at 5 bets when I wanted to give 10 bets. Combining these differences with the BetAdvisor system and the UK system and the limitations imposed by BetAdvisor due to the first season of bets and you can see why a big difference in performance was created between the BetAdvisor system and the UK systems. 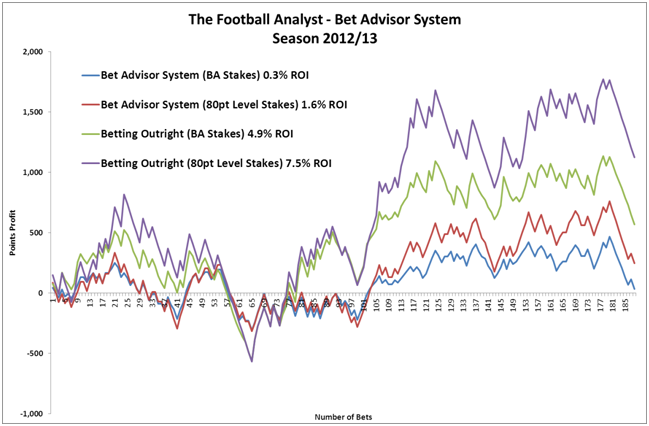 For the 2012/13 season, there were 28 UK systems available to TFA subscribers and 1 system available on BetAdvisor. The 28 TFA systems created a profit of 933pts from 9,269 bets to 1pt level stakes. An ROI of 10%. The lowest ROI for any TFA UK system last season was 4.3%. All 28 systems were profitable and all bets were proofed to the Secret Betting Club. The BetAdvisor system achieved a profit of 34.8pts with an ROI of 0.3% from 188 bets. Therefore, the BetAdvisor system was the worst performing system that I managed last season. I’m happy to admit that it was a very poor first season on BetAdvisor. It is incredibly frustrating that from 29 UK systems last season, the BetAdvisor system is the worst performing system in the TFA portfolio by far. Obviously, the plan was to have a BetAdvisor system that was amongst the best TFA systems but for a number of reasons discussed above, this didn’t happen. Before I discuss changes for next season, let’s look at the results in a little more depth for the BetAdvisor system. 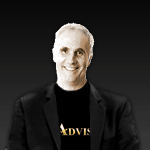 When doing this analysis, I have looked at 4 ways to follow the TFA BetAdvisor system. 1). BA System (BA Stakes) – This is the system’s performance last season on BetAdvisor. It looks at the P&L of the system based on the stakes used. 2). BA System (80pt Level Stakes) – This is the system’s performance last season on BetAdvisor based on a level staking plan, rather than the variable staking plan I used. As I said above, the staking was a bit awry at times due to the exposure limits and a 40pt bet one week may have been a maximum bet that week whereas a 60pt bet the next week may have been an average bet that week. 3). Betting Outright (BA Stakes) – Rather than using the AH line last season on BetAdvisor, I have assumed that we could have backed the team outright to win the game. I have used the same advised stakes as the BetAdvisor system last season. 4). Betting Outright (80pt Level Stakes) – Rather than using the AH line last season on BetAdvisor, I have assumed that we could have backed the team outright to win the game. I have assumed a flat staking plan of 80pts level stakes on all bets. I think what we first need to analyse is the difference in performance between each of these 4 betting methods. Number (1) mirrors what happened last season on BetAdvisor and number (4) mirrors what happens for TFA subscribers (and my service’s proofed results) where all bets are 1pt level stakes and teams are backed outright. Here’s a graph of the performance of each method. I was a little surprised when I first looked at these results for a number of reasons. Firstly, as we move from 1 to 4 above, the profitability of the system improves. No real surprise here as 1 is the safest way to follow the bets (asking for a handicap most of the time) and 4 is the most riskiest way to follow the bets (backing outright). Like all betting systems, the more risk you take, the higher the returns and therefore, in return for trying to give BetAdvisor subscribers a smooth return, I have taken a system with a 7.5% ROI and turned it into a system with a 0.3% ROI. Hence, I have eroded the edge of the system completely on BetAdvisor by adopting the AH line closest to 2.0. Secondly, the overall outright performance of the BetAdvisor system isn’t as good as it should be. An ROI of 7.5% over 188 bets isn’t great. If I do a quick comparison with some of the other TFA systems last season which had a similar level of bets, they produce an average ROI of around 15%. Therefore, even betting outright, the BetAdvisor system wasn’t as good. Why is this? Well, I was aware of this already from last season but the very best bets that my ratings throw up tend to shorten significantly in price from the time I give them out on a Thursday evening. Therefore, by the time Saturday morning comes, a lot of the value is gone. Of course, given the fact these are my best bets, most of these are thrown up on the BetAdvisor system too. Sometimes, I would still issue the bet at much reduced odds but most of the time, the value in the bet had gone. My only option in this situation is to replace the bet with a lower value bet thrown up as at least the odds would still be there for this bet. However, considering the Bet Advisor system was supposed to be the best bets that my ratings throw up, I have clearly had to sacrifice a lot of profit through a reduction in odds or by giving out weaker bets for the BetAdvisor system that I would like. I think there are a number of interesting things to analyse from this table. If we look firstly at the big priced underdogs on this system, then these will be the ones where I have suggested a handicap of +0.75 or higher. As you can see from the table, there were only 12 of these bets last season but none of the 12 teams won their games. By using the AH though, this loss was minimised greatly. Clearly, a sample of 12 bets is too low to draw any concrete conclusions but the point is, asking for a +ve handicap for these teams seems to reduce the variance and in the case of last season, increases the profit. The next set of bets are important as this is the largest group of bets and it is these bets that have defined the TFA service over the last 3 years. These are medium priced teams (2.88 to 4.00) and these generate most of the profits in the main service. 95% of these bets will be Away bets. On the Bet Advisor system, this would be the lines +0.50 and +0.25. As you can see, very interesting results. A loss of 90.4pts on the BetAdvisor system but if backing outright, a profit of 765.8pts. An even better profit can be achieved if using level stakes rather than the staking plan I used last season. Using level stakes achieved a profit of 1,363.2pts. That’s a significance difference in profit between the BetAdvisor system and what TFA subscribers would have achieved on the same subset of bets. Clearly, I have taken a very profitable group of bets, the bets that the TFA service hinges on and through the use of AH betting and a variable staking plan, I have turned a 20.5% profit on these bets if backing outright and using level stakes into a 1.8% loss. Quite scary how this can happen! The AH0 line is an interesting one as there doesn’t appear to be a massive difference in performance between each of the methods but the sample size of 34 isn’t very large. The next set of bets are the most profitable and 95% of these are home bets. The AH lines are from -0.25 to -1.00. It is a sample size of 64 bets. The same trends are apparent as on the other bets above. The BetAdvisor system did well and made a profit of 465.6pts last season on these bets. However, if backing outright, a profit of 614.8pts was achieved. Going one step further and using level stakes saw a profit of 959.2pts. Using an AH on big priced underdogs has helped to smooth the profitability and improve the overall profits. Using an AH on other bets reduces the edge the system has significantly and can turn a winning system into a losing system. Generally speaking, using a variable staking plan last season reduced the profits on the system and using level stakes would have increased profits. If we look at the performance by League, all we see is conflicting trends. If looking at the results of the system last season, League Two was a big loss making season for the system. However, if following outright, a profit was achieved and if using level stakes, a bigger profit was achieved. League One is the opposite though. A loss was achieved on the system but if using outright betting and level stakes, a massive loss was created. The other leagues also have conflicting trends. I don’t see anything within the analysis by League that would lead me to adapt the system or to reduce the bets in any league. I think the sample sizes are small in all the leagues and since there are conflicting trends, it doesn’t make sense to try to draw any conclusions at the moment. I think that gives a quick overview of the performance last season of the BetAdvisor system and hopefully goes someway to explaining why the Bet Advisor system ended up 29th out of 29th of all TFA UK systems last season. I guess the question is….what can I do to improve the performance next season? The combination of these 4 points above ensures I can follow a level staking plan next season and more importantly, I can hopefully follow a larger number of bets without the hassle of worrying about whether or not my exposure will be capped the following week. Although I can’t blame the restrictions last season for the poor performance of the system, I can recall a few times when I had very busy weekends and was unable to play all the bets and likewise, I can recall being unable to play higher stakes at certain times on winning bets due to the restrictions after a poor weekend. With these restrictions relaxed a little more, it should help the BetAdvisor system perform a little more in line with my other systems. A level stake of 60pts will be used for all bets next season – with a 2,000pt bank, this assumes that the system needs a betting bank of 33pts (to 1pt level stakes). With average odds of around 3.00 next season, I would think this bank should be adequate. The target will be to achieve a 10% ROI and a higher turnover of bets than last season. If we assume 250 bets at an average stake of 60pts, this will be 15,000pts staked. A 10% profit would generate 1,500pts profit. With a 2,000pts betting bank, this would equate to a return on capital of 75% across the season. I feel the combination of the removal of the restrictions from BetAdvisor, less AH betting, more outright betting and moving to a level stakes staking plan will help improve the profitability of the TFA BetAdvisor system. We’ll see what happens. Good luck to anyone following next season and if anyone has any questions, I’m happy to answer any questions through BetAdvisor. Click here to see The Football Analysts history and results.